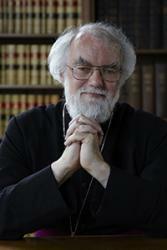 Dr Rowan Williams Public Lecture: Worshipping God, Growing the Church, Loving the World. Dr Rowan WilliamsThe Chaplaincy Team at Bangor University is very pleased to announce that their public lecture this year will be given by Dr Rowan Williams. Acknowledged internationally as an outstanding theological writer, scholar and teacher, Dr Williams has written extensively across a very wide range of related fields of professional study including philosophy, theology, spirituality and religious aesthetics. He has also written throughout his career on moral, ethical and social topics, and has more recently turned his attention to contemporary cultural and interfaith issues. Dr Williams was elected as Archbishop of Canterbury in 2002, stepping down in 2012 to move to the role of Master of Magdalene College Cambridge. In this public lecture, Dr Williams will address the relationship between worship and practical service to show that divisions between the two are artificial. He will examine the importance of working at our perceptions of reality and each other in order to ensure our service is effective and not self-serving. This public lecture is open to all and takes place on Monday 24th April at 7 pm in Pontio Level 5 Lecture Theatre. The lecture will be delivered through the medium of English.